PEO, a philanthropic organization that promotes educational opportunities for women, is sponsoring their annual Author Event Fundraiser on May 5th at Dillon Community Church in Dillon, Colorado. The featured speaker for the day is Karen Wyatt MD, hospice physician and author of "What Really Matters: 7 Lessons for Living from the Stories of the Dying." This book has played a key role in bringing about positive transformation in the lives of many people. Dr. Karen Wyatt, hospice physician and author, will be discussing her book of stories from her work with hospice patients, "What Really Matters: 7 Lessons for Living from the Stories of the Dying" at a fundraiser for the Dillon, Colorado chapter of the Philanthropic Educational Organization (PEO). Each year the Dillon chapter hosts an Author Event, featuring a woman author with an inspirational story to tell, to raise funds for its mission to be a source of encouragement and educational support for women. This year the event will be held on Saturday May 5, 2012 at the Dillon Community Church. Dr. Wyatt's book "What Really Matters" tells the stories of several patients and their families as they approached death and details the life lessons that were learned through that process. In addition the book provides a discussion about those lessons and teaches readers how to apply them to their own lives and find new meaning and purpose in their existence. According to Dr. Wyatt the book was written to help educate people about hospice services but also to ease fears of dying so that life can be lived and enjoyed more fully by everyone. She is pleased to participate in this fundraiser for PEO because the organization does so much to support women as they discover their own purpose in life and take steps to make it a reality. Dr. Wyatt states, "So far I have heard from many readers that this book played a key role in bringing about positive transformation in their lives. If that is true then I have been able to fulfill my own purpose with this book and I am grateful for being given that opportunity." To help support opportunities for other women please consider attending the Author Event with Dr. Karen Wyatt on Saturday May 5, 2012 at 10 am, Dillon Community Church. Refreshments will be served and tickets are $15.00, available at the door or by calling 970-668-5358. PEO is a philanthropic organization where women celebrate the advancement of women; educate women through scholarships, grants, awards, loans and stewardship of Cottey College; and motivate women to achieve their highest aspirations. Read more at http://www.peointernational.org. 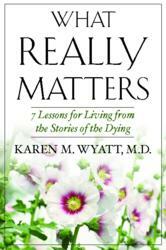 Dr. Karen Wyatt is a physician and author who writes about spirituality and end-of-life issues.